A few days ago I boarded an American Airlines (well, I booked through British, but these days airlines are whatever it is they are…) flight from New York to Rome, where this week I will be teaching my first Summer course on Stoicism. 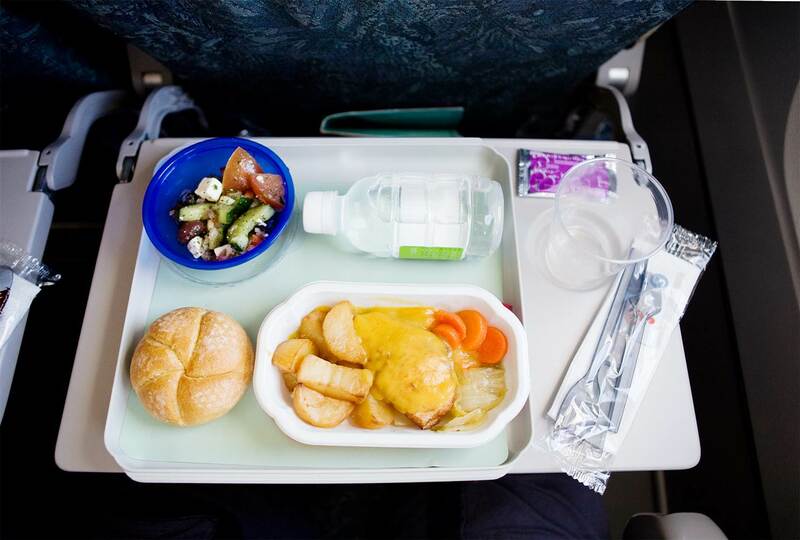 By any standards, it was a pretty typical, uneventful flight, with a little bit of turbulence here and there, the usual substandard (and now increasingly “standard”) airline service and “food,” and so forth. And yet, it also turned out to be a pretty good chance to practice some elementary Stoicism. My practice began shortly after I sat down in a lateral three-seat row, where, fortunately, I was able to book myself an aisle seat. (This simple accomplishment is increasingly difficult to realize, because airlines are now selling all sorts of “extras,” from the privilege to board ahead of others so that you have a chance of finding space for your luggage to, yes, the ability to get a much coveted non-middle seat, especially on intercontinental flights). The guy next to me immediately turned on his overhead ventilation (even though the cabin’s temperature was already very much on the coldish side), directing it mostly at my left arm. After a short time during which I gauged just how much this annoyed me, I politely asked him to re-orient the fan on himself, away from my now freezing arm. His first response was “well, I need it on.” I pointed out — again, politely — that there was no contradiction between our diverging needs, since it is easy to redirect the fan appropriately. He did, barely moving it. The air was still coming pretty much straight on my arm. So after another minute or two I reopened the conversation (again, politely), and asked him to make an additional effort in the same direction (i.e., away from me!). He grudgingly (and, once more, barely) obliged, muttering “you may have to use your blanket.” All of this, mind you, and we hadn’t even left the ground. At that point I analyzed my options from a Stoic perspective. I wasn’t going to let the guy irritate me for the whole flight, I had better things to do, like write an entry for this blog (not this one, one of last week’s Stoic advice marathon), as well as get at least 2-3 hours of sleep so that I wouldn’t be completely jet lagged during my first day in Rome. At the same time, I wasn’t going to let my harm freeze and “stoically” (notice the small-c) get through the night. I briefly considered calling the flight attendant and let her settle the matter, but then I thought this was simply far less important than it appeared at first. I took my blanket, wrapped it over my shoulders (rather than around my legs, as usual) and tested just how uncomfortable I was. Turns out, this was actually a very good idea. I had a reasonably comfortable flight, did not freeze, and was able to sleep for several hours. Indeed, I will adopt the technique on future flights quite regardless of my neighbor’s behavior and fan orientation! Let’s pause for a moment and notice that this is not an example of “quietism,” of laying down and taking an injustice in the name of maintaining a stiff upper lip. It was simply a deliberate judgment concerning what the situation was, what options were available to me, and which course of action was both efficacious and worth pursuing. Had the guy, say, aimed the fan straight at my face, I would not have pulled a blanket over it, and I would have asked the flight attendant to either address the situation or move me to another seat. A little later on (by this time we were in the air, about to leave the air space of Canada), the flight attendant passed by, bringing us drinks, then our meals, and finally picking up the resulting litter. In the course of these operations, she twice spilled something on me (remember, I was in the aisle seat, so she had to reach over to serve the guy next to me). On the first occasion this was a bit of water, the second time some of the litter generated by my neighbor’s meal. Rather than getting upset, starting yelling at her, or whatever it is some people do under similar circumstances, I shook the water off my jeans (in the first instance) and picked up the litter and handed it to her with a smile (in the second instance). Again, this was not a example of being passive and take abuse for the sake of acting “stoically” (small-s), but rather the recognition that flight attendants have a stressful job (my brother is one, so I know) and that small incidents like those can easily happen. The result of my actions was stunning. Not only the woman in question sincerely apologized, both times, for her clumsiness (which was at least in part actually my neighbor’s clumsiness), but she later on returned to my seat, leaned over, and with a broad smile said “sweetie, you tell me whatever you need for the rest of the flight and I will bring it to you, I really appreciated what you did.” Turned out that I didn’t need anything special for the rest of the flight, but that sincerely felt thanks was very welcome. When we landed in Rome she smiled at me again on my way out, clearly relieved that she had not ran into a jerk instead. Well, I certainly can’t claim to be tranquil, collected and cheerful under all circumstances. But it took surprisingly little to act that way on my flight to Rome, which made the experience just a little bit better for both myself and a fellow human being. This entry was posted in What Would a Stoic Do? on July 10, 2017 by Massimo. First class! (pun intended). I always look for some humour and attempt to pass it off as a light joke, with a friendly smile. Everyone benefits but the self benefits the most. Cabin crew have a very difficult job and anything we do to make it more pleasant has a knock-on effect, benefiting other passengers as well. More generally, the strange environment of mass flight can seriously stress out people, resulting in obnoxious and or bizarre behaviour. I call it Cabin Fever. It is an amalgam of sotto voce existential dread, crowding, forced intimacy, discomfort, powerlessness and failed expectations, which, when combined, make a toxic combination. Alcohol can exacerbate this. A friendly response that makes use of humour is not quietism, it is an act of taking charge of the situation that gives generously to the people around you. The problem is that many people see life as a transactional balance sheet. This is a toxic model for life because it focuses our attention on losses, which we feel compelled to compensate with gains, and so maintain the balance. Thus we are granting undue attention to the pains of life and create conflict as we strive to maintain a positive balance. This is real good, practical advice. And I like it very much. I appreciate how you’ve connected behaviour in a modern, common (so many people fly these days), real life situation with ancient writing. It brings stoicism to a real, attainable, daily practice. Actually the very first benefit I realized from applying Stoic principles was maintaining my composure and equilibrium in precisely such situations. I am also now a calm, patient driver. Nice post! I enjoyed it. I’m curious. What, if any, consideration did you give to moving the ventilation yourself? It was ‘in your power’ to do so and I’m doubtful whether the purchase price of the ticket conferred sovereignty over the ventilation directly above a passenger’s head. You could have accompanied the movement with a self-deprecatory comment along the lines of ‘sorry, it must be my age but I do suffer so from the cold’! Or: ‘believe it or not, I’m a professional stoic: but I just can’t endure this cold and so, if you don’t mind, I’m moving the ventilation’. I see nothing necessarily unstoic in meeting any uncivil response with a short sharp slap. Without anger, of course! Well, that course of action never occurred to me because I would have thought it rude. Each passenger does have an assigned ventilation fan, and to manipulate another passenger’s would be like turning on or off their own overhead light. Lately I happen to see a lot of people getting really angry at small deals. I am really a calm person (I could say I tend to overthink if any), so when I oversee those scenes, I feel unconfortable. But, you did show a great piece of conquer of your temper in your flight. Thanks for sharing this meaninful event!